The Personal Telethergraph is the standard issue communications device within the United Kingdom of Planets and the British military. 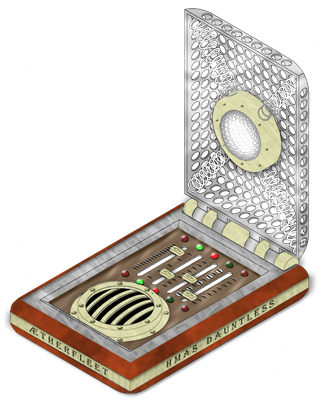 Physically the device is about the size of a cigarette case and opens to reveal the audio output amplifier and controls located on the interior face. On the inside top cover the voxiphone is suspended on an anechoic plate suspended by isolation springs. The controls allow the device to perform a variety of functions. The primary function being two way voice communications. A frequency modulator allows the device to send and receive signals on a variety of hyper luminary channels. Two standard encryption translators can be programmed into the device and should be updated frequently to assure secure communications. The telethergraph also can also be used to send a homing signal that is easily detected by Eloptic and æthervotic means. A limited memory device allows the recordation of audio content so the telethergraph may be used to record and playback messages often substituting for a personal log recorder while on missions. By specially modifying a telethergraph it can function as an audio translation device if the language database is available and small enough to be stored in memory. The functional range of a telethergraph is approximately 2,000-mile line of sight or 1,200 indirect assuming that another telethergraph is receiving. Ship based communications systems can communicate with telethergraphs for even extremely high orbit providing that the unit is within line of sight. The telethergraph emits an audio cue or silent vibration to alert the user of an incoming message. When issued the device is coded to the user so that appropriate communications are received. It does not take an engineering genius to listen in on another users comm. channel but the act can be detected by one skilled in communications. A telethergraph will be issued to all Raf personnel performing functions off the ship. Officers tend to carry their telethergraph in an inside breast pocket while enlisted crew usually wear theirs on their belts. It is possible to link telethergraphic systems to MACs, video, Æthervox or long range communication equipment to exceed their original Specifications. The telethergraph is powered by a neodynium crystal, which can support constant use for up to 22 hours and has an average operational endurance of a week. The crystal can be recharged using a Veridigen energy cell and power transformer. The telethergaph is built to withstand operations in hostile environments including vacuum, high heat, frigid cold, corrosive gasses and atmospheres to the pressure 90 ft of water. Whether or not they can actually function in these environments is not determined but they will survive in such environments to be used later. Similar telethergraphic devices have been integrated into all RAF æthersuits and personal craft.